If you want to get to know Kopřivnice you should diligently go through the whole route of the Kopřivnice part of the Lachian nature trail. It passes through the most attractive places in Kopřivnice and its surroundings. The trail includes 18 thematic panels, 4 of them are common to the Štramberk branch and approaches the various attractions of the town. In addition, there is a series of remarkable views of the countryside. The trace is circular with a short detour to the castle ruins of Šostýn. 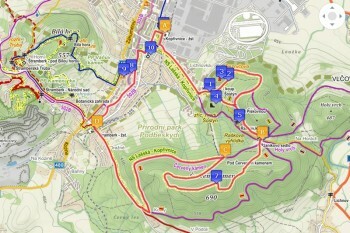 The total length of the nature trail is 16.8 km (a 16 kilometer circuit with a 400 meters turnoff). The highest point of the trail is on top of Red Stone with a height of 690 meters above sea level. The lowest point is the Park of Dr. Edvard Beneš with a height of 326 meters above sea level. 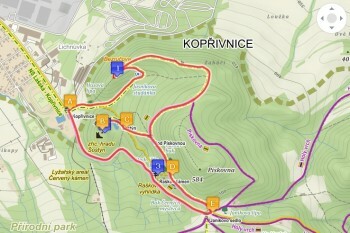 The total elevation gain is 364 m.
Stops on the trail the Botanical Garden, Kamenárka, At Virgin Mary and the White Mountain are common to both the Lachian nature trail in Kopřivnice and the Lachian nature trail in Štramberk. The trail officially begins and ends at the train station in Kopřivnice, but the trace may be variously modified (see cruise lines). Some stops and parts of the trail are available with a baby stroller or on a bicycle (depending on the physical fitness of every tourist). The trace is marked by a mark for nature trails by the Czech Tourist Club. Although the trail begins and ends in front of the ČD station in Kopřivnice at the information board, which provides information about the entire line of the trace and its parameters, it can be variously customized, shortened and changed. TIP: You can also use the so-called cruise lines, which partly use the trace and points of the Lachian nature trail. For the Red Stone area, a good starting point is parking at the swimming pool. For the area of the White Mountain parking in Alšova Street near Bailiff's House Museum, possibly at the Botanical garden. TIP: In this area, you can use shortened cruise lines! From the train station in Kopřivnice (when standing with your back to the building) go left along the mark of the nature trail on Hans Ledwinka street around the supermarket Penny Market. At the Husova street intersection turn left along the ice stadium. Go across the railway crossing and continue along this street up to the summer swimming pool. Information board for Red Stone and the signpost of Kopřivnice, the swimming pool is at the parking place. Go down a stony path that is lined with mature trees on the right side. After a few tens of meters there's stop No. 1 – Hus' lime tree. From the lime tree continue along the forest walkway through the Butterfly valley along an unnamed creek. After about 450 meters you come to the board with stop No. 2 – Jasník's Well. From it go further down the sidewalk to the crossroads of four paths. Here turn left and follow the narrow path you come to the ridge of Brdy. On the left is Bezruč Viewing Tower and stop No. 3 – Bezruč Viewing Tower. The trace continues to the right along the ridge No. 4 – Ridge of Brdy. The path leads further along the ridge to the point where the ridge meets the glade with the crossroad. Turn left onto the forest road and down this way you come to another crossroad of three roads, on which you go right down. During a period of vegetative rest you can turn left to climb a short but steep hill, and after about 100 meters turn right on -an initially wider and then narrowing - forest path that leads us to the top of Pískovny where there is a nice view in good weather. Unfortunately, nothing is visible through the bushes and foliage in summer season. From there go the same way back to the crossroads of the three roads, where you disconnected from the way. A road continues to the left. The entire detour is labeled with small green triangles. The trace is shown on the map. Along a broad road you will reach another crossroads with a triangular island with a few trees. You are at the crossroad Pod Pískovnou. From this crossroad along the steep path to the right a detour leads to the ruins of Šostýn. But first, you come to stop No. 5 – The crossroads of witches, where five paths meet. From the crossroad, continue along the Šostýn pond and then up the hill to stop No. 6 – Šostýn Castle. You will get to the castle ruins if you continue uphill along the yellow mark. You return the same way back to the crossroad Pod Pískovnou. Turn right on the way leading along the contour line around Pískovna. After several hundred meters, you glimpse the massive limestone rock through the trees on the right side. It's stop No. 7 – Raška's Stone. From Raška's Stone continue around the Beech of black hunters to stop No. 8 – Janík's Saddle. You should sharpen your attention, particularly your sense of direction, because you have to first find a narrow path whose direction is marked, but not its beginning. Stand with your back to the thematic board. A weakly visible path begins on the edge of the meadow in front of you and it takes you into the forest. Continue on the path upwards until you reach the wider forest path and turn right and continue along the mark up the hill. Below the top of Red Stone you will notice concrete blocks on the right, the remains of the original ski lift. Using the footpath running along the blocks you get to a small platform below the top with the board of stop No. 9 – Red Stone. At the very top of the hill you can climb the path to the left from the board. The top of Red stone is the highest point on the nature trail and the Lachian Gate of the Beskids. From the top, with breathtaking views, continue along the ridge to the point where the way turns almost upright, right, down between a wooded clearing and a full grown forest. 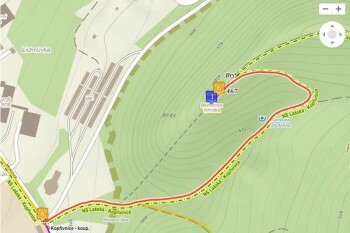 After about 150 meters turn right again onto a path that leads in its first part to the contour line around Red Stone. The last part of the journey crosses the slope on the Red Stone. At the crossroads of the so-called round trip, turn left and join the route for less experienced and less demanding tourists. The trail for less experienced tourists, beware of the fact that 650 meters of this section is not labeled with the symbol of the nature trail. If you stand with your back to thematic board No. 8 - Janík's saddle - directly in front of you, the first part of the relatively soaring, rocky circle trip starts, which continues along the contour line around Red Stone. At the tourist signpost Below Red Stone (Pod Červeným kamenem) the nature trail joins the slope again. (the trail is shown on the map). Circle trip leads up to stop No. 10 – Circle way and continues around Red Stone. Afterwards, the path turns to the left and drops down the hill. 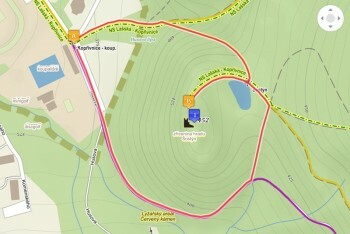 At the next crossroad, turn right and you will reach the asphalt road, which links Lichnov and Štramberk. Turn right and you will get to the train station in Štramberk, where the information board of the Lachian nature trail is located. The trail leads from the station along a wooden bridge over the rail yard. Continue up the hill to the left when you pass a gas station. At the bus stop, cross the road and continue right up to the restaurant Na Palárně. After about 100 meters turn right up a steep hill. Behind the terraced garages, which are on the right, the path turns left. At the next crossroads turn right again. On the left side you pass the entrance to the Botanical Garden – stop No. 11. If it's opened, you can pass through it to the upper entrance gate, where you join the trail. Otherwise, continue along the asphalt road, which then turns into a panel road, continue up to the probe of the underground gas storage. The panel road turns into a grassy one here. You will come to the rocks that surround the entrance of the quarry. Turn right on the rocky path leading along the edge of the quarry up and you will reach stop No. 12 – Kamenárka. The footpath from Kamenárka continues to the saddle, which lies between Kamenárka and the White Mountain. There, a massive lime tree and "a memorial of the Virgin Mary" is located - stop no. 13 - At the Virgin is close by. From there you can see Štramberk square and Trúba tower. Continue on the slightly rising footpath into the woods. It is called the Solar trail and it leads you through its switchbacks to the foot of the lookout on the peak and to stop No. 14 – The White Mountain. From White Mountain, continue along the stony and concrete "Hrstka way" down. At Hrstka's stone, the path turns almost 180 degrees to the left, but you should continue to the right. After 30 meters turn left down between the trees and along the path you will come to a freestanding rock. Stop No. 15 – Váňa's Stone is at the lowest point below the rock. Then you descend down the path to Váňa's cross which stands on an asphalt road – Záhumenní Street. Turn left and follow Záhumenní street to stop No. 16 – The Bailiff's House Museum. After visiting the museum, continue down Záhumenní street to the first turn to the right. The way leads along the walls of the old cemetery. Turn slightly left and cross the bridge over the small river Kopřivnička. Behind the bridge turn left again, along the new bicycle path Kopřivnička. Along the creek you come to Erben street. There you turn right and you will see the Church of St. Bartholomew. You will reach the main street Štramberská. Go across the street to the left to stop No. 17 – Masaryk Square. Continue along the main road towards the town center. The information board of the last stop No. 18 – The Park of dr. E. Beneše is left of the entrance to the park. Along the pavement of flat stones continue to the asphalt road. Go through the right lower part of the park. Then on your left you will pass both villas of the Šustala brothers and after the second one (the Lachian museum in Šustala villa) you exit the park and go left to the railway station in Kopřivnice where the trail ends. The Kopřivnice part of the Lachian nature trail passes through the most attractive places in Kopřivnice and its immediate surroundings. Individual stops on the trail (18 thematic panels, 4 are common to the Štramberk branch) touch on points of interest from history, zoology, botany, forestry, mycology, dendrology, geology and hydrology. On the trail, there is a number of panoramic views of the countryside, for example from the top of Red stone, from the Bezruč viewing tower and especially from the viewing tower of the White Mountain in the Silesian-Moravian Foothills, the Beskids, Oderské Hills and with optimal visibility to the Jeseníky Mountains. The Kopřivnice branch of the Lachian nature trail was established in 2001 and in 2013, it was modified thanks to the project "Actualization of the Lachian nature trail in Kopřivnice", which was co-financed by the Moravian-Silesian region from the Grant program to support education in the field of the environment. The trail is circular with a short detour to the ruins of Šostýn. The highest point of the trail is the top of Red Stone with a height of 690 MAMSL, the lowest point is the Park of Dr. Edvard Beneš with a height of 326 MAMSL (the total elevation gain is 364 m). Trail stops: the Botanical Garden, Kamenárka, At the Virgin Mary and the White Mountain are common to the Lachian nature trail in Kopřivnice and the Lachian nature trail in Štramberk. The total length of the trail is 16.8 km. It begins and ends at the railway station in Kopřivnice, but the trail can be variously customized. Parts of the trail are accessible with a baby stroller or on a bike.